Are you strong with the Force? Prove it. Join us for the 2018 May World Championships on May 2nd – 6th! 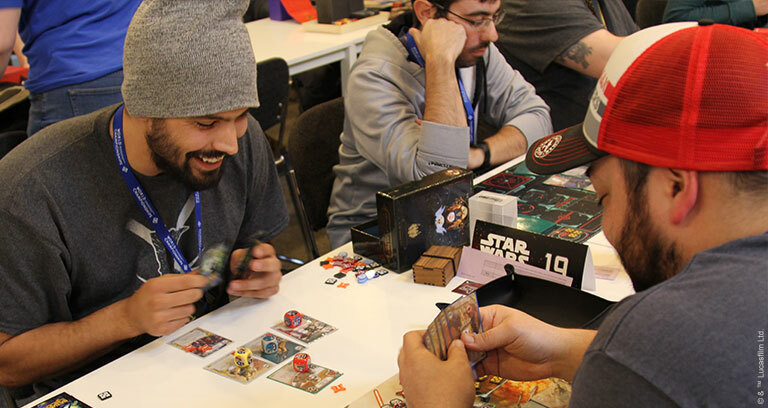 The 2018 May World Championships are the pinnacle of Organized Play for five of the Star Wars galaxy's greatest tabletop games—Star Wars™: Armada, Star Wars™: Destiny, Star Wars™: Imperial Assault, Star Wars™: The Card Game, and X-Wing™. For five days, the top competitors for each of these games will gather at the Fantasy Flight Games Center in Roseville, MN. They will come from across the globe to represent their local communities against the world's best players. They will roll dice, move ships, and play cards. And they will battle for the fate of the galaxy. But it's not just the fate of the galaxy that's at stake. The World Championships will feature a wide range of exclusive prizes, including The Greatest Prize in Gaming, the World Champion's opportunity to inspire the design of a future card for his or her game. Do you think you have what it takes to claim the title of World Champion? Players with reserved seats can claim those seats now, and other players can now apply for the remaining seats! The 2018 May World Championships are five days of thrilling competition. But they're more than just competition. They are an energetic, five-day celebration of the Star Wars galaxy. Throughout the World Championships—and in a host of side events—we will see ace starfighter pilots engaged in fantastic, high-speed dogfights. The galaxy's most iconic heroes and villains will leap into heated lightsaber duels. Cunning fleet admirals will spring traps that they lay far in advance. And Rebel strike teams will race across contested battlefields—only to find themselves confronted by Darth Vader, the Dark Lord of the Sith. There's a whole galaxy of action and drama to explore, and the five days from May 2nd – 6th are jammed full of top-level competitions and thrilling side events. 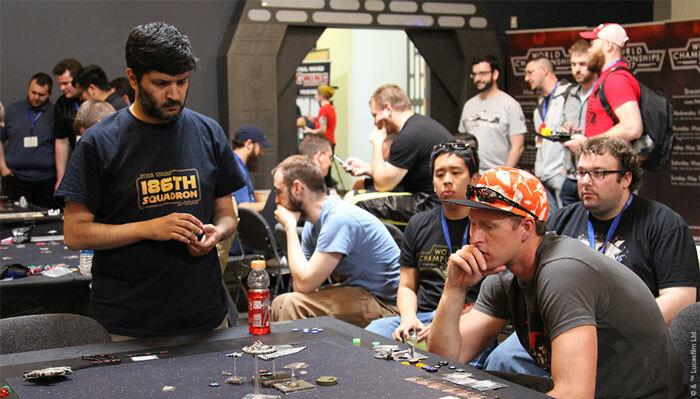 We have at least one free side event planned for all of our games, and to accommodate the tremendous demand for more X-Wing and Star Wars: Destiny events, we have taken advantage of our auxiliary space at the Radisson to offer a slate of On Demand Hangar Bays and Destiny pods. Want to learn more about the schedule? Download the World Championship Schedule and Side Events Schedule posted below! Join us for this year's May World Championships. Have fun with the Force. Fight for the fate of the galaxy. And take your shot at the title of World Champion. Update — April 23rd, 2018: All tickets for the 2018 May World Championships have been claimed. Here, you will find step-by-step application instructions, a Worlds application timeline, and several important notes about your application and registration. 1) Make certain you submit your application through the correct form and by the appropriate deadline. Regional Champions, National Champions, Galactic Qualifier Champions, World Champions, and other players with reserved seats should use this form. Applications due March 26, 2018 by 11:59 PM CDT. General applicants (without reserved seats) should use this form. Applications due February 20, 2018 by 11:59 PM CST. Members of the press should use this form. Applications due March 30th by Noon CDT. 2) FFG will draw names from the general applicants and send invitations to all players who are awarded seats (via reserved seats or lottery). 3) Once you receive an invitation, you may purchase your ticket. February 5 — Applications open. February 20 — 11:59 PM CST. General application closes. February 23 — Invitations sent to players drawn from general application. Invitations sent to reserved seat holders who submitted an application on or before Feburary 20th. March 4 — 11:59 PM CST. Purchase deadline for general applicants with invitations. March 26 — 11:59 PM CDT. Application closes for reserved seats. March 30 — NOON CDT. Press applications due. March 31 — NOON CDT. General applicants may redeem their invitations on a first-come, first-serve basis. April 10 — NOON CDT. Any remaning tickets are made available to the public. Follow @FFGOP on Twitter for updates throughout the process. All applications must be submitted and received through the forms we provide. Limit 1 application per person. When you apply for a game with multiple Day 1 events, you are not applying for a specific day. Your day will be assigned. Your application for other games will not be taken into consideration. You may swap your event ticket for Day 1 of an event with another player's ticket for a different Day 1 of the same event. You are responsible for finding another player to swap with. (We recommend the 2018 May World Championships Ticket Swap community forums.) Both members of a swap must fill out the appropriate form (https://tinyurl.com/y8v5pulv), and all exchanges must be submitted by both players by April 17th at 11:59 PM CDT. After all ticket swaps are processed, players who swapped tickets will be contacted if they still hold tickets for multiple events on the same day. Players will be asked to indicate which ticket will be cancelled and refunded. You may not exchange the event ticket for one game for the event ticket for another game. There is no charge to apply and no obligation to make a purchase. Your application does not guarantee you the opportunity to purchase one or more open seats for the 2018 May World Championships. The number and percentage of applicants selected will be determined based on availability. Application acceptance and reserved seats are specific to their game (and day). Purchases not completed by listed deadlines will void acceptance or reservation. Tickets are non-refundable. All seats purchased are subject to the Code of Conduct and venue policies, which may be amended at the sole discretion of Fantasy Flight Games at any time. Please provide an accurate email address, and be sure to check spam folders and filters for emails before contacting [email protected] with any questions. Note: Updated to reflect Daylight Savings Time change.